þá er þeir fara við vitni at vega. With forty more unfolding wide. When for martial deeds inclin'd. When they go forth to fight 'gainst Fenris the wolf. 19. Five hundred and forty doors there are to Wal-hall I ween. Eight hundred of the Chosen shall go out of each door at one time, when they go forth to fight the Beast. when they fare to fight with the Wolf. 24. Five hundred and forty doors Are built into bright Valhalla: Eight hundred warriors through one door Shall go out to fight with Fenris. 23. Five hundred doors and forty I think there are in Valhall; eight hundreds of warriors will go together from one door when they go to fight the wolf. when they go off to battle the wolf. "M. Olsen's provocative theory that the constantly fighting warriors and the 540 gates to Valhall were a recalling of the experiences gathered by a Scandiavian traveller to the Colosseum with its constant combats of gladiators in Rome, aroused much attention. Even if this recall was not the basis for the actual Nordic myth of Valhall, it is nonetheless a possible source of the later poetic treatment of the material. The number 800 times 540 = 432,000 einherjar mentioned in the Grímnismál can possibly be traced back to Hellenic incluence, and is not a number of any particular symbolic significance. 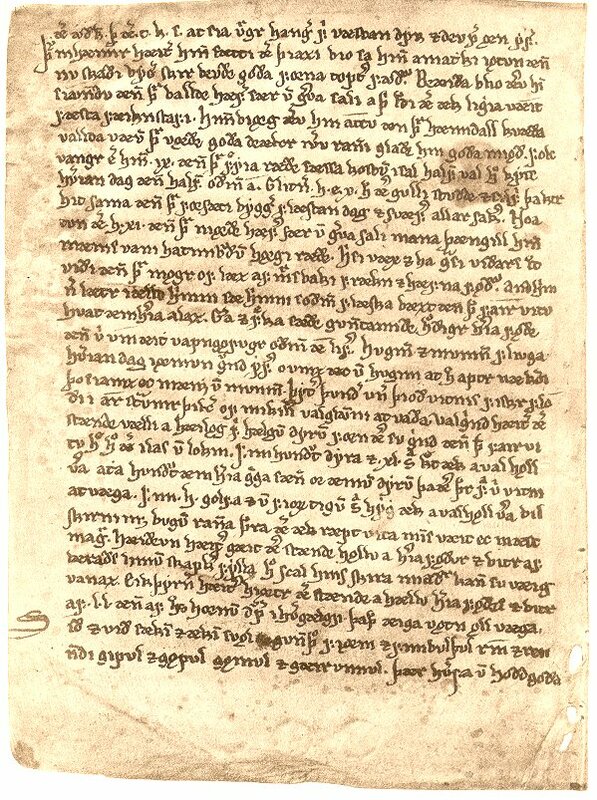 It is by no means certian if the number is at all correct and if the Grímnismál did not use the Germanic value of hundred (=120)"
"hundruð: Not clear whether this is the so-called 'long hundred' i.e. 120; the building may have either 540 or 640 doors." In R, verses 23 and 24 are reversed. Here, these verses are arranged according to the A manuscript. Then said Gangleri: "These are marvellous tidings which you now tellest. A wondrous great house Valhall must be; it must often be exceeding crowded before the doors." When they fare to fight with the Wolf." 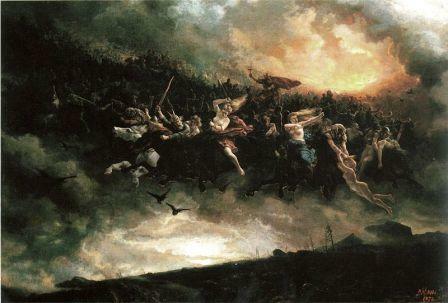 It is known that in the final battle of the gods, the massed legions on the side of 'order' are the dead warriors, the 'Einherier' who once fell in combat on earth and who have been transferred by the Valkyries to reside with Odin in Valhalla—a theme much rehearsed in heroic poetry. On the last day they issue forth to battle in martial array. Says the Grimnismal (23): "Five hundred gates and forty more are in the mighty building of Walhalla—eight hundred 'Einherier' come out of each one gate—on the time they go out on defense against the Wolf." That makes 432,000 in all, a number of significance from of old. This number must have had a very ancient meaning, for it is also the number of syllables in the Rigveda. But it goes back to the basic figure 10,800, the number of stanzas in the Rigveda (40 syllables to a stanza) which, together with 108, occurs insistently in Indian tradition. 10,800 is also the number which has been given by Heraclitus for the duration of the Aion, according to Censorius (De die natali 18), whereas Berossos made the Babylonian Great Year to last 432,000 years. Again, 10,800 is the number of bricks of the Indian fire-altar (Agnicayana). "To quibble away such a coincidence," remarks Schroder, "or to ascribe it to chance, is in my opinion to drive skepticism beyond its limits." [F. R. Schroder, Altgermanische Kulturprobleme (1929), pp. 80ff.]. Just as the solstices and equinoxes mark time, so they also help humans orient themselves in space. Imagine yourself back in the era with no electricity, clocks, wheels, or cities: it also had no roads, no Triple-A maps, no compasses. How do you find north (or true east)? The sun's shadow can give you a rough idea, but the stars are far more accurate. The Egyptians of 2500 B.C. located exact north by clever observation of star alignments around the celestial pole, to orient their pyramids [Spence 2000]. Also, the sun rises and sets at the equinoxes at points due east and west, and north/south runs perpendicular to the line between those points. But how do you find any of that on some other day of the year, especially if you are a traveller, someone with no permanent markers? The trick is to learn when and where the stars rise and set, not just alone but as a system [cf. Kyselka 1987]. Within it, the constellations in which the sun rises and sets at the summer and winter solstices mark, at that time, the farthest north and south that the sun ever moves (with east/west halfway between), providing another set of four benchmarks from which time and direction could be reckoned (figures 22b, 33). (Stones set up at Stonehenge and elsewhere mark these key positions.) In a world before magnetic compasses, roads, and signposts, such celestial sightings were critical for travel in general and navigation in particular. But eventually we run into trouble. Suppose you have inherited a myth telling you that the sun rises at the summer solstice where you see the constellation Leo the Lion and the spring equinox sun rises in Taurus the Bull. Yet as you watch the sun year after year, you find it shifting ever so slowly out of these constellations into the next ones, Cancer and Aries, and furthermore, the end of the rotational axis no longer sits in quite the same section of the sky as before: North has moved. What a catastrophe. Not just for the calendar, but for navigation, since all the coordinates marking direction must now be reestablished. Travellers remember, don’t have fixed chin-rests but depend on celestial markers. In fact, such a celestial shift actually happens: the “fixed” stars aren’t quite fixed. This slippage results from the wobble in the earth’s rotation (like the wobble of a top at the end of its spin) that causes the end of the tipped pole to wander in a huge slow circle through the northern stars (figure 35). When the Egyptians built the pyramids around 2500 B.C., the sky rotated not around Polaris at the end of the Little Dipper but around Thuban, a brightish star in nearby Draco the Dragon (see Spence 2000 for pyramid features set on and hence datable by this difference). After that, there was no "pole star" for millennia: the position of the pole could only be reckoned from nearby configurations. The change in where the axis points also causes the sunrise at the equinoxes and solstices to move, exceedingly slowly, against the backdrop of the Zodiac. In fact, it takes nearly 26,000 years to complete the cycle, a rate of 2160 years per zodiacal sector (if these are allotted an equal 30° apiece: 12 x 30° = 360°; 12 x 2160 = 25,920). As the pole wobbles, the positions of the equinoxes and solstices slide slowly through the Zodiac in the opposite direction from everything else. Thus the sun currently moves from a background of Gemini to Cancer during July, but about 2000 years ago the June solstice slid the opposite way, from Cancer into Gemini. (Since the astrological system used by our newspapers was fossilized more than 2000 years ago, most people are misinformed as to the constellation that "ruled the sun" when they were born. Thus if your birthday is July 4, you were actually born when the sun was in Gemini, not Cancer.) Because this slow wobble is, from our monthly point of view, in the direction of the “preceding” constellation, the phenomenon is now known as the precession of the equinoxes, but it might be better called the shift of the celestial north, or Northshift. In mythology it had other names. Several other names, in fact, according to the analogies used to describe and remember this difficult yet crucial navigational information. How for example might one encode the relentless precession if one habitually described the heavens as rotating around a pole— whether it was a mill, drill, spindle, or churn? Surely some evil force—that is some Will working against the assigned order of things— is knocking the rotating fire-drill or mill-wheel axle off its socket. Worldwide, the owner of this vulnerable mill turns out to be Saturn, he who first gave the measures of the universe, and the mill-shaft’s unseating results in some mythologies in a vast, open whirlpool or Maelstrom in both sky above and Ocean below (Readers interested in these widespread myths can persue the data collected by Santillana and Dechend in Hamlet’s Mill). …Without myth to encode and transmit the critical data, preliterate societies would be hard pressed to know that precession out of one constellation into the next both had occurred and would occur again, on a regular schedule. For if the precession moves 30 degrees in 2160 years, it takes 72 years to move a single degree (about twice the diameter of the moon), a rate so slow as to be barely perceptible within a single lifetime. ….. So the existence of precession was known and mythologized by some cultures before the constellational shift ca. 4300 B.C.-a Stone Age date that differs little from the latest date by which the Egyptian calendar must have been set up, 4241 B.C.16 At that point, people in the Near East would have been settled down with permanent chin-rests more than long enough to notice that their alignments, set up to work out a solar calendar after the invention of agriculture, were sliding relentlessly out of whack. 17 To those for whom the stars were immutable, this realization must have been shattering: the very frame of the sky moved, however slow the wheels. The ancients vacillated as to whether the appropriate mythical analogy for precession should be reciprocating motion as with the churn or fire-drill, which turns one way then an equal amount back, or continuous rotary motion as with mill-wheels and spindles. Indic myth opted for reciprocation, mythologizing the churn (in the Ocean of Milk: figure 31) and fire-drill (pramantha), whereas Plato, following the Pythagoreans (the Greek inheritors of the "deep" astronomical tradition), chose rotation, citing the "spindle turning on the lap of Necessity" [Republic 10.617b], as did Germanic and Finnic myths with their periodically upset mill-wheels, and the Harappans with Shiva's recurrent whirling dance of world-destruction (figure 16). The problem was that although people had been noting precession through several stages of the Zodiac, so they knew the frame turned and knew roughly how fast, they had observed considerably less than half a cycle (13,000 years), so they didn't know if it would keep going or turn back. Several scholars suggest that some myth-tellers not only knew of the precession but even had a close idea of its cycle [Campbell 1962, 117-20]. (It moves one degree in 72 years, 30° or a twelfth of the Zodiac in 2160 years, and the entire circle in 25,920 years-72 X 360°). These suspicions arise because of the numbers associated with "Flood" myths. For example, the five approaches to Angkor Thorn in Cambodia, constructed as a cosmic map, each depict 54 gods and 54 demons540 in all-tugging on the serpent-cord wrapped around the celestial mountain-pillar (represented by the temple) that serves as dasher to churn the Milky Ocean: 540 x 4 = 2160. (The temple is twelfth century, but the story goes back to the Mahabbarata and Ramayana, epics composed 2500 years ago.) Similarly, the Grimnismal says Valhalla has 540 doors, from each of which 800 warriors will emerge at Ragnarok [S&D 162]: remember that the Trigon of Saturn and Jupiter, crucial to timekeeping, revolves completely in 800 years; 540 X 800 = 2160 X 200 = 432,000. But 432,000 is the astronomical number of years which Berossos (the Babylonian priest who tried to summarize his country's accumulated wisdom for the conquering Greeks in 281 B.C.) ascribes to the combined reigns of the ten mythical kings who preceded the Flood. A quarter of that number (540 X 200, or 2160 X 50) equals 10,800, the number of stanzas in the Rig Veda, of bricks to be laid in an Indic fire-altar, of years said by Heraclitus to constitute an Eon, and so on [S&D, 162]. These numbers keep recurring. More myth-borne evidence of clocking the cycle comes from a cuneiform "king-list" written about 1700 B.C. (Weld-Blum tablet 62) that totals the ten antediluvian kings' reigns at 456,000 years [Jacobsen 1939; Campbell 1962, 119]. If Berossos's 432,000 reflects knowledge that it takes 72 years to move one degree, then 456,000 would exactly reflect a belief that it takes 75 years. This earlier and slightly less good approximation (amounting to 27,000 years per round, rather than 25,920) must then have been refined further before Berossos wrote nearly 1500 years later; but it is still far better than Hipparchos's crude estimate of 36,000 years, suggesting a much longer period of noting the shift than he had access to. Hipparchos worked almost alone; the Babylonians passed down traditional knowledge in myth over millennia.